Update: I have a new updated and expanded list of Halloween and Fall quilts here. I love fall. Love every part of it. It’s time to start pulling out my fall decorations and quilts. Now that it’s October 1st, I thought I’d share some Fall and Halloween inspiration with links to some of my favorites, including re-visiting some oldies from the past. 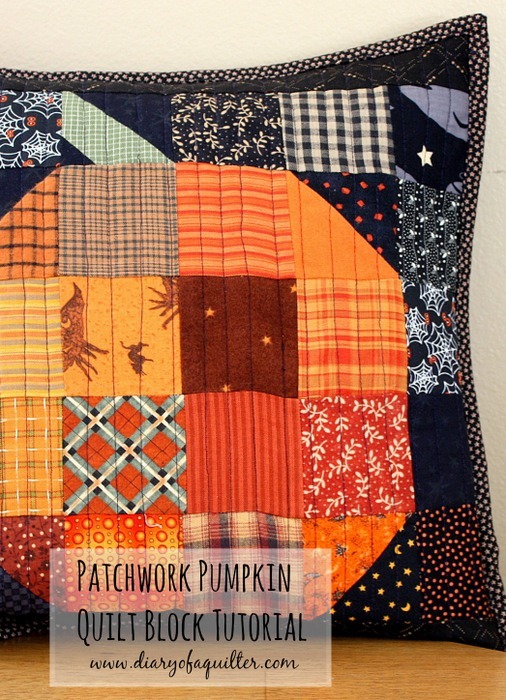 One of my favorite – and most popular – recent projects is this super simple, scrappy Patchwork Pumpkin quilt block. I made mine from all scraps. You can find the tutorial here. The tutorial contains an added variation for making a whole pumpkin-patch table runner. 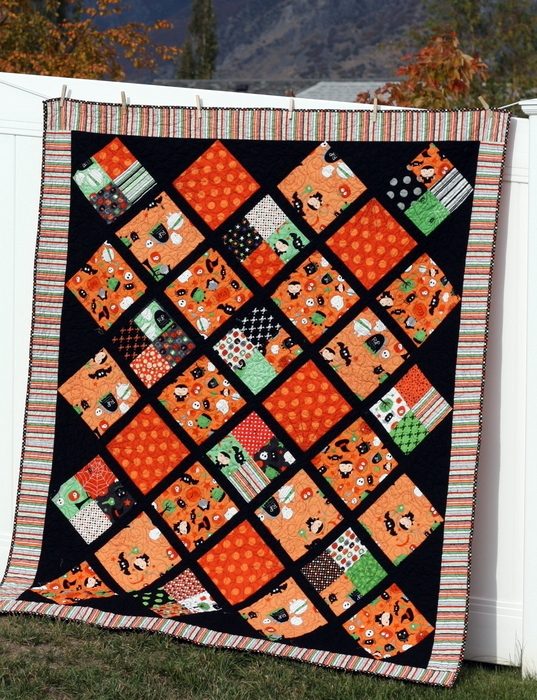 This Halloween Bunting quilt is made using my Summer Bunting quilt pattern. It’s a perfect quilt for showing off big, fun Halloween prints. This simple Halloween quilt is perfect for showing off cute novelty Halloween prints. This quilt pattern is similar to my Lattice Quilt Pattern. This is our Halloween quilt I made a few years ago. I wanted to do something modern in Halloween colors that would use up lots of scraps as well as the assortment of novelty prints I’d collected over the years. This is a fun style if you’re not as into novelty prints, but want to make something just in fall or Halloween colors, like this one by Allison Harris, which very much inspired my own quilt. 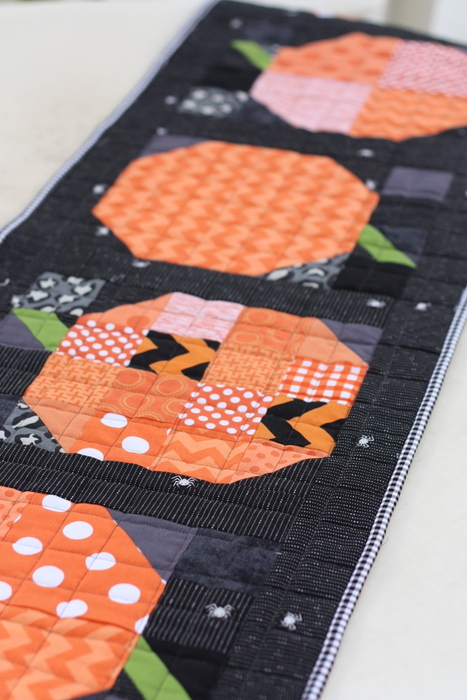 Another quilt using Halloween colors, but not overtly Halloween-y is this Disappearing nine-patch tutorial from Jedi Craft Girl. 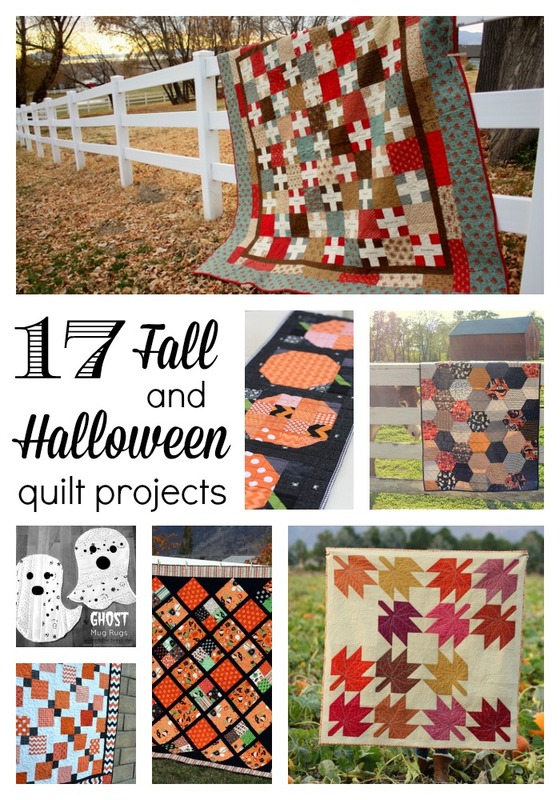 Some other fun Halloween-inspired blocks and quilts include (many on my to-make list) include the Large Hexagon Quilt by Polkadot Chair, Ghost mug rug by Patchwork Posse, these Barn Bats by Elizabeth Hartman, Candy Corn Bunting by Modern Handcraft, and of course a good spider web quilt. The Moda Bake Shop has this great Spiders and Webs quilt tutorial by Heidi Grohs. If Halloween is not your thing, here are some fall/autumn-themed projects to inspire you. This is my version of a Modern Maples quilt – taking a traditional maple leaf block and blowing it up. You can find a free tutorial for the Modern Maples block here. Some years (most) I haven’t had time to make a big fall-themed project, but the colors are in my head and begging to be played with. So I get that out of my system by making small projects like Table Runners. Here is a simple tutorial for a quilt-as-you-go table runner. Another example would be a quick mini quilt. This one is made with the 2 1/2″ charm squares (Quilter’s Candy by Moda). I supplemented with more prints from my stash. Tutorial here. I wrote this as a pattern for the book Sweet Celebrations with Moda Bake Shop. You could also use any traditional signature block to create your own similar result. Follow Amy Smart’s board fall sewing projects on Pinterest. I especially love the patchwork pillow using indigo and various shades of orange and rust instead the traditional black. I had just spotted the pillow in Pinterest yesterday and here it is today on Bloglovin’, so I guess I’d better make it myself!! Now I need to make Every single one of those! Excellent blog post! Love all your wonderful fall ideas. What a great post. Thank you for all the great ideas for fall projects. What a great post! All these projects are great….my favorite is the Gratitude quilt…love the fabrics so much…it was funny, as. I was reading the post, I was thinking that it would be nice to see a close-up, and there it was, a little further down the post! 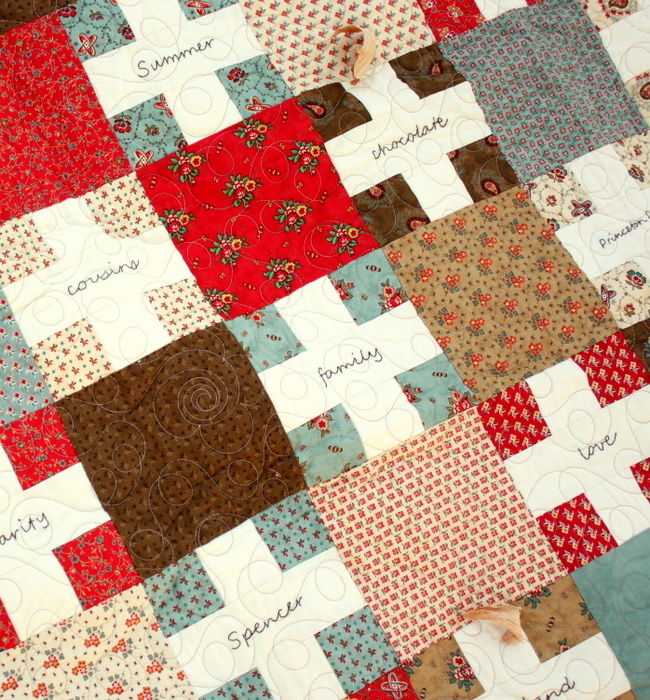 Thanks for always inspiring us by sharing all the quilty goodness!! I love your photos and quilts, lovely all. Thanks for sharing! 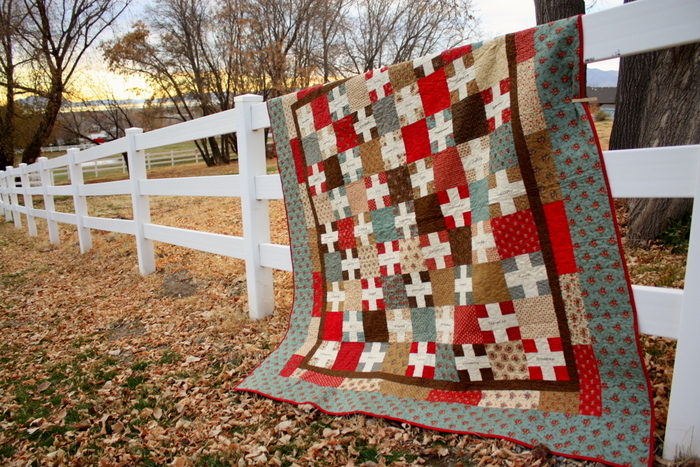 These are such beautiful and fun quilt projects! I need to work on some new Autumn quilts/table runners myself. It seems every time I turn around, one of my daughters is “stealing” them! LOL It’s true. So I need to get busy. Thanks for sharing these lovely photo’s. I love that pumpkin pillow how inspirational…Im smelling apple cider candles watching cold rain outside , had a bowl of soup and thinking about your pillow for napping!! JUST BEAUTIFUL! LOVE THIS QUILT! NOW I’LL “HAVE TO BUY THIS BOOK” TOO!!! I love your Gratitude quilt and want to make my own some day. I also have the barn bats tutorial flagged for “someday.” Thanks for a great roundup! I made your pumpkin pillow last fall- my favorite fall pillow! Thanks for the inspiration! I love Fall too. I have so many fall UFO’s and I’m a “seasonal” quilter so I’d better start. (I quilt year round but like to be working on the current season. Your post did offer one dismaying reminder. I have a bunch of apple blocks I won at the guilds block of the month several years ago. Where did I put them? Thank you so much, Amy! Of course, you’re exactly right! I have bought some beautiful material in Fall colors and was looking for what to do and now I know. We will have a beautiful Modern Maple Leaf table runner! Huzzah! I am so excited that I can bring these colors into my house and enrich that feeling of the changing of the seasons for my family. I tell you, I love sewing and I’m so glad that I have started! Those little ghost mug rugs are adorable! Who wouldn’t be cheered up using those? I really can’t thank you enough, and all the other creative, dedicated bloggers out there, who share your time and talents to help others learn and grow. I just can’t wait to get myself out of bed and go sew this morning! Believe me, as a handicapped person with constant chronic pain, that in itself is a gift. Sometimes you do more than you know when you’re writing these tutorials. So, thank you very much again! I’m off to go sew! You have shared some magnificent tutorial links. There are several that I will be adding to my to do list. Thank you for sharing and have a wonderful creative day! Thanks so much for sharing these!! Only problem — I NEED to make them all! I have always loved your Thanksgiving quilt. And I know I need to make a pumpkin pillow or table runner. Thanks so much! Your Gratitude Quilt is beautiful! It’s just perfect to this time of year, as the fall season is upon us. I just love fall and all the fall themed decorations. Thanks for sharing these inspiring projects! Love all of these projects especially Modern Maples! 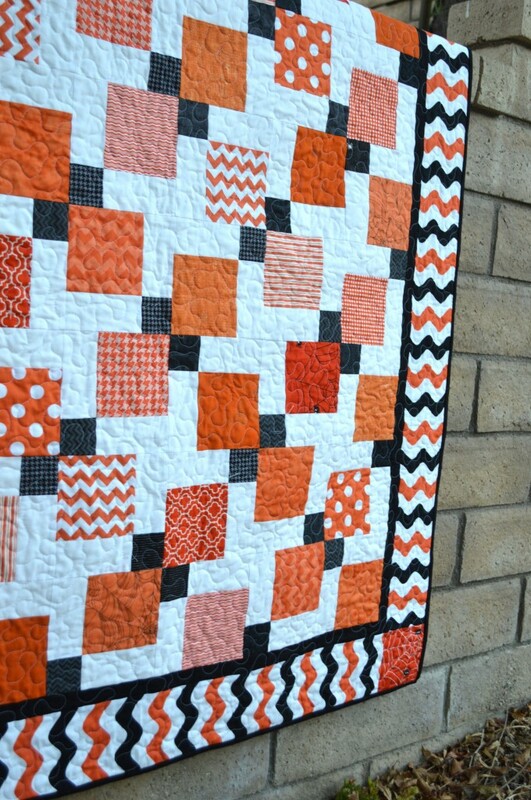 The stripy Halloween quilt just jumped right out at me. I love it! And I can totally see a charming Christmas one in the same vein. Good thing there are so many cute fabrics that are holiday-themed! What a great idea. Thanks for all of the Fall inspiration, Amy. I love your gratitude quilt. I’ll have to add that to my list. Such fun projects! Is there a pattern or tutorial for the scrappy Halloween quilt? I couldn’t find one here or on Allison’s blog I’d love to make one.